The first item is important because in order to build yourself a fortress strong enough to make you confident that you’re meeting or exceeding your goals, you need to know how your brain handles time in general, and idle time specifically. I’ll get back to this momentarily. The second item is a hurdle for some people, myself included. I actually sat down today and spent almost the entire day revamping my entire time-management life, which is what prompted me to write this in the first place. But one day per year does not a commitment to time management make. Time management is a daily exercise. But this is not why I think people have a hard time committing to time management. It’s excrutiatingly hard to commit to time management for a whole host of reasons, but one I never see discussed is that you must simultaneously commit to giving up time *mis*management, which gets into how your brain treats idle time. If you’re mismanaging your time, and you’re a system administrator, you’ve probably formed habits that fill the idle time between tasks. Maybe you chat on IRC, habitually check mail, or muck with playlists or something. These are just things to keep your hands busy until your brain remembers what it was doing before. It is an unfortunate circumstance that our jobs are prone to a large number of context switches in a given day. If you don’t have a method of moving from task to task, and you suspect you might be a little ADD, context switches become *VERY* expensive. Managing your time means managing, and maybe parting with these habits. That can be hard. Imposing things like this on yourself will force you to get creative, though, and your daily routine will likely be the better for it. For example, I decided that, to maximize the time I allow myself to spend keeping up with current events, I’d employ a news feed reader. Turns out, I keep up with far, far, far more news, in a small fraction of the time I used to spend reading various news outlets. (if anyone is curious, I use Google Reader). My point is, once you commit to managing your time, you either won’t miss, or will find a way to more efficiently partake of your past time-wasters. Ok, so this is where I turn to Tom and say “cover your ears for a minute”. My goal in revamping my time management system is to completely rid myself of my personal analog assistant. It’s true. And I think I’m just about there. I started using the Franklin/Covey system of time management in 1996. I had, in the past, kept copious journals and meeting notes in conjunction with a DayRunner or something like that. It wasn’t what you’d call super effective. My Franklin was the first thing I had ever seen that you could call a cohesive time management “system”, and I liked that concept a lot. I could’ve done without some of the personal philosophies in the reading material that came with my system, but the time management principles were rock solid. So what’s the problem then? Well, to be honest, I don’t much like carrying this thing around. It’s not that I can’t or I won’t – I will. I just don’t particularly like doing it. I’ve had a lot of reasons I’ve hung onto my planner in spite of digital solutions. “My planner doesn’t crash”, or “I don’t have to boot my planner to make a note in it”, or whatever. But here’s the thing: I don’t have to boot my blackberry, or whatever phone I might have on my belt in the future, and I have more confidence in a given web service being up on any given day than I do in remembering to stuff my planner into my backpack. Those of you whose jaws are still on the floor will understand more as you read about the solutions I’m implementing to get my new system up and running. I hope it will help someone. 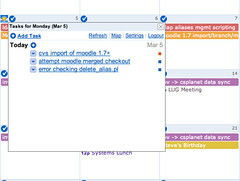 The quick overview for the impatient is this: I’m using google calendar in a way for which it’s not *really* intended, combined with a *sick* tool I found to sync bidirectionally to a local calendar, combined with Remember the Milk task lists (and tagging, and contexts, blah blah), combined with my Blackberry. With all of these working, I am just about as confident in my ability to get things done as I was with the planner. You’ll have to be a little more patient to find out what tools I’m using to *save* time, over and above simple time management. I create a new calendar for each project I work on. I also created a calendar for office-related events like staff meetings and luncheons that take place in the department, and one for my wife and I to keep track of things going on in our lives. I believe the Getting Things Done (GTD) paradigm would loosely consider this a use of ‘contexts’, and it is nice to be able to hide the project calendars and personal calendars and focus on what I’m doing *now*. However, this isn’t precisely why I did things this way. The reason for all of the separate calendars is because I work in an environment where you sort of manage your own projects. At any given time, anyone in my group could be actively working on 2 projects, actively maintaining another 5 projects that have been deployed, planning a future project, and doing the normal day-to-day work of our department. One thing this has forced me to do is plan out, at the month level, what I’m going to dedicate my time to. So, for example, I’m working on automating a data synchronization routine. It’s going to be a rather nasty Perl or even nastier awk script. I believe that, given the trappings of life in my department, the complexity of the task, the testing involved, etc., that this could well take me two weeks to complete. This falls under my “Data Warehouse” project, so I create an event on that calendar which represents the task. Of course, you can just make the task last for two weeks, but I’ve found that making a daily repeating task lends a bit more flexibility to the equation. For example, if you delete a single task that lasts two weeks, it’s all or nothing. You’re deleting the entire thing. But with a daily repeating task, you can move things around a bit more easily, maybe deleting a day in the middle because a fire needs putting out, or moving a day from the end to the beginning to start a project a day early. Organizing things in this way is just a laying of the foundation, but I think it’s a good one. Once you have multiple tasks in multiple project calendars, you’ll start to see your calendar’s month view become a multi-colored indication of what you’re doing and where you’re headed. Don’t think, though, that this is the end of the story. There’s more. I want Google Calendar to be my primary calendaring interface, and that works for my brain. However, if I’m without an internet connection, I should be able to at least see a local copy of my web-based calendar. Ideally, I could even add events to the local calendar, and have it sync to Google Calendar when things are back online. If you happen to use a Mac and iCal, you can do this right now with Spanning Sync. There *are* solutions, though, for other platforms. I’ll cover one or more of those in a later posting. DISCLAIMER: At time of writing, Spanning Sync is a beta product. There *are* some glitches. So far, though, I haven’t found any that have caused data loss or extreme malfunctions of any kind. The one bug I found, in fact, turned out to be a bug in how Google Calendar handled repeating events scheduled before March 11, but which don’t begin until *after* March 11. No big deal – my event was shifted forward an hour, and it’s not even a Spanning Sync bug. One other thing you should know about Spanning Sync is that when you install it, it installs as a preferences dialog that you access through System Preferences on your Mac. You don’t launch it from the Applications folder. That little tip would’ve saved me several minutes of fishing around for it. Eventually, the plan is to charge for the service, but the pricing structure isn’t set in stone yet. There has been rather passionate debate about this in the discussion group online. See the specific thread here and give Charlie and the gang your feedback. Your data *is* going through the Spanning Sync servers. I’m not sure that anyone who is syncing with a Google Calendar (which sits on servers you have no control over) should really care that this is happening, but they will anyway, so here’s more information from Charlie, which is part of another passionate thread. It needed to have a Google Calendar plugin, and that plugin needed to let me add, remove, postpone and edit tasks. RTM does precisely what I wanted it to. No complaints there! It needed to have some way of adding tasks from my Blackberry. It uses an inbox that you can send email to to add tasks, and it also has a very usable interface for mobile devices – even my slow-as-all-getout Blackberry 7290 has no problems with it. It even appeared to me to be downright <gasp!> snappy! Number 3 was crucial because since my Blackberry is *always* with me, and I can now *always* add a task to RTM from my Blackberry, and RTM syncs with both GCal and iCal, I don’t need to *always* have a planner. This is the one bit that *isn’t* quite done yet. GCalSync is like Spanning Sync for cell phones. It’ll bidirectionally synchronize your phone’s calendar with Google Calendar. It seems to work wonderfully for some people, but there’s a whole collection of people like me who are running into errors specifically with certain versions of RIMs Blackberry software indicating that GCalSync needs to be signed by the “RIM Runtime Code Signing Key (RRT)”. I’m confident that this will be resolved either the next time I upgrade my Blackberry, or with the next release of GCalSync. You tell me – I think I pretty much nailed it for my needs, and the rest comes down to what works for you. Is it a bit of a cobbled-together hodgepodge? Well, it doesn’t really feel like one to me. The only thing I ever *really* use is Google Calendar with the RTM plugin. Everything else is essentially to insure that I can add a task no matter where I am, without booting a computer. My fingers hurt. In future posts I’ll cover some of the tools I use to save time and get the tempting time wasters out of my face. I promise. Scout’s honor and all.